Yeager’s Law by Scott Bell is a credible action story. It even had a small twist at the end that I didn’t see coming. 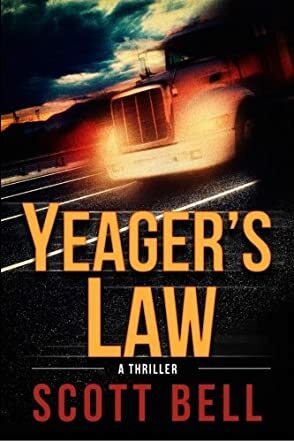 The Yeager in the title is Abel Yeager, a divorced ex-Marine turned long distance trucker. His love interest is Charlie Buchanan, a bookshop owner whose ex-husband has involved her bookstore in shady dealings, putting Charlie and their son, David, in extreme danger. Abel’s best friend and former brother-in-law is “Por Que,” a childhood friend and former military chopper pilot. Between stolen money, angry drug lords, and acts of revenge, more than one mob is after Abel and the pallets of books in his missing truck. Good thing Por Que still has a helicopter and an extra pilot and ace mechanic, Cujo, a crazy man who is so brain damaged that he often forgets his given name. Scott Bell has the background for all the different threads in Yeager’s Law, the first book in Bell’s series about Abel Yeager. His writing style is descriptive, but to the point. The chapter or section titles tell the reader the location of the next chunk of text, so it’s easy to follow along with the many shifts in locale. As the tensions build, these shifts get shorter and choppier, moving the action along quickly. The minor characters are perhaps more cardboard than they could be, but this isn’t enough of a negative to affect a reader’s enjoyment of this very interesting, action-packed story.